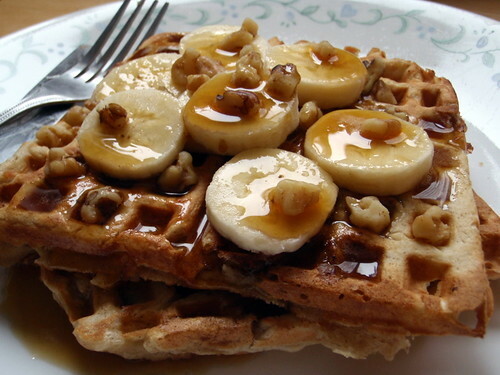 When I was originally looking for yeasted waffle recipes, I stumbled across this one for Banana Bread Waffles. I know, right? What an awesomely yummy idea! The more I thought about it, the more I was tempted to skip the waffle face off and just make these. But ordinances must be followed, so I saved this one for last. The only thing I changed was that I added some walnut pieces to the batter right before cooking since I had some lying around, and since I didn't have ground ginger or ground cloves, I added a pinch of allspice. Oh, and I halved the original recipe since I only had 2 bananas. In a large mixing bowl, sift or whisk together the flour, brown sugar, yeast, salt and spices. Pour the wet ingredients into the dry, whisking until smooth. Stir in the beaten eggs. Cover the bowl loosely and refrigerate for at least 12 hours, but up to 24. When ready to begin, stir the sour cream into the mashed bananas and then mix the fruit and walnuts (if using) into the batter. It will deflate, but use a light, quick hand to thoroughly combine. 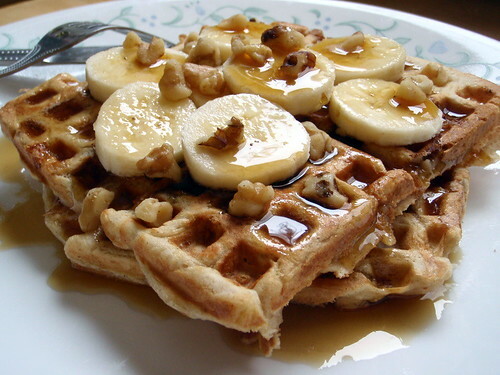 Serve with maple syrup and additional slices of fresh bananas and walnuts, if desired. Leftovers can be frozen and then reheated in a toaster or in an oven; keep the heat low and an eye on them though, they brown quickly. Yummy, yummy, yummy .... so yummy! Haha that's what I'm humming right now just by looking at the photo.